Lin Wilder’s series of Dr. Lindsey McCall medical thrillers include many references to the Texas Medical Center in Houston, Texas where Lin worked for over twenty-three years. Her first novel, The Fragrance Shed By A Violet: Murder in the Medical Center, was a winner in the 2017 IAN 2017 Book of the Year Awards, a finalist in the category of mystery and a finalist in the NN Light 2017 Best Book of the Year Award in the category of mystery. Malthus Revisited: The Cup of Wrath, the fourth in the medical mystery series, won Silver/2nd Place award in the 2018 Feathered Quill Book Awards Program for the Women's Fiction category. Malthus Revisited was selected for the NABE Pinnacle Book Achievement Award Winners for Winter 2018 in the category of thrillers and selected as a finalist in the IAN Best Books of 2018 in the category of action/adventure. The book won best suspense novel in 2018 in the NN Light Best Books of 2018. I, Claudia A Novel of the Ancient World was released in December 2018. Finding the Narrow Path is the true story of why she walked away from -then back to God. Finding was a finalist in the 2018 IAN Best Books of 2018 in the category of Non-Fiction, Religion/Christian. 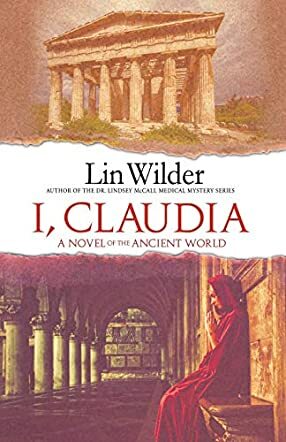 I, Claudia: A Novel of the Ancient World by Lin Wilder is one of the fascinating books I have read — wonderful historical references, Christian and mythological underpinnings, with strong considerations of some of the troubling spiritual questions of all time. Born in Delphi and daughter of the last of the Oracles of Pythia, Claudia Procula is the wife of Lucius Pontius Pilate, who decides to share her story. Her husband already dead for several decades, Claudia lifts the veil and offers readers a unique version of events they have read in history and from a surprising perspective, that of the wife of one of the key players in the drama of the agony and death of Jesus. This narrative captures the early culture of the Jewish people and the friction between the religious authorities and the Romans. One interesting element is the portrait of Pontius Pilate, which is different from what popular literature has created of the man. “Like me, Lucius is the subject of vast ignorance, lies, and injustice. The very name Pontius Pilate has become synonymous with cowardice and betrayal.” The narrative from the perspective of the protagonist is powerful, even absorbing. Lin Wilder allows the story to flow through the words of the daughter of an Oracle, a voice that reflects something deep and mysterious. Listen to how she describes herself: “I am nearing the end of my life. Seventy-nine years lived as a shadow, a face behind a curtain, whispering the residues of a dream. Insubstantial, unheard. But my time of silence is done.” The use of biblical allusion, religious symbolism, and mythology transforms the narrative and creates a spiritual atmosphere that is intriguing and exciting. The prose in I, Claudia: A Novel of the Ancient World is gorgeous and the author’s language reflects the setting. Beautiful scenes greet the reader’s mental gaze, from the bustling surroundings to the day-to-day lifestyle in the house of Pilate. Beautifully paced, ingeniously plotted, and skillfully written, this novel is a page-turner for both fans of historical personages and narratives with strong religious themes. The author did the research thoroughly, but it is how the results of that research are woven into the story that will wow most readers. Claudia was a true daughter of Delphi. Her mother was cruelly taken from her when she was just two years old and she was raised in Athens by her aunt and uncle. They kept her true identity as the last oracle a secret and raised her to be a well-educated yet willful girl. Despite a falling out with her aunt, she always knew her future was already ordained. Her betrothal to Lucius Pontius Pilate was orchestrated at the age of ten and five years later she begins the journey to meet her future husband. Following a harrowing journey, she meets Lucius for the first time and the chemistry is palpable. She has a genuine love for her husband although she knows their time together is limited. She has visions from the oracle and is aware that she is a part of a momentous piece of history. I Claudia: A Novel of the Ancient World by Lin Wilder is the story of the woman behind Pilate, one of the most infamous characters in Christian history. This is a fascinating book that takes a different look at a familiar story. Claudia is a young girl who blooms into the wife of a leader. Judea is a troubled place and Lucius is tasked with keeping the peace in dangerous times. The story of Jesus is well documented but this is a whole new perspective. I felt such empathy for Claudia as she failed to carry a child to full term, knowing her time with her husband was to be short-lived. I, Claudia: A Novel of the Ancient Times describes her pain and suffering as she supports her husband who is trying desperately to save the life of Christ. Lin Wilder is a fantastic writer and places her reader squarely in the time of Jesus and the ensuing emotional turmoil. I look forward to her next novel with bated breath. I, Claudia: A Novel of the Ancient World by Lin Wilder is the story of Claudia Procula and Lucius Pontius Pilate. A Tribune at 28, after success in battle in Germania, Lucius Pontius Pilate was appointed Prelate of Judea to rule over the Jews. They were considered to be a fractious, unruly people that answered only to a god who’d given them very specific rules of behaviour, diet and morality. A troublesome bunch, they fought among themselves in various factions, united only against a common enemy: Rome. Judea was a powder keg of trouble and the least spark could set it off. Not only that, a troublemaker called the Baptizer was turning people’s minds and a prophet called Jesus of Nazareth was drawing crowds with his talk of spiritual matters. This is the background for a wonderful love story between Claudia Procula, intelligent and well-educated daughter of the last of the Oracles of Pythia, and Lucius Pontius Pilate, a Roman soldier and hero. History has labeled the real Lucius Pontius Pilate as being the man who allowed Jesus to be crucified. However, the truth of the matter is that the situation was alarmingly more complex and volatile. Caught between the rock of the Sanhedrin and the hard place of Rome’s authority, Lucius was unable to deal with the festering political and religious issues of the time. Compromise was the only answer. And was that compromise somehow all part of God’s grand plan, even if it entailed the sacrifice of His only son? Such interesting questions are raised here that will intrigue both Christian readers and those of other faiths. Reading this story brings to life a tale well known to many Bible students. The author cleverly incorporates enough ancient historical detail into the narrative to inform the reader while maintaining the flow of the story. The dramatic unfolding of events is told in short alternating chapters between Claudia and Lucius, and in this way her maturing and the development of her powers as an oracle, and both of them falling in love with each other come across beautifully. Their emotional love story is set against the backdrop of a tumultuous chain of events which we see as both Claudia and Lucius are affected by the man people called the Messiah. Quotes from Cicero, Seneca, Plato, Socrates, and other renowned writers and thinkers of the ancient world add extra food for thought and give insight into the mindset of the characters. The pace is measured and in line with historical events. The region and the era saw its fair share of political turbulence and I liked how the author conveyed this throughout the narrative. The descriptions also evoke vivid imagery of the past, the setting, and social customs and behavior. This is a well-written and researched story that will satisfy fans of historical fiction as well as romance. The story itself encompasses themes and ideas which go far deeper than a review can adequately portray. Being a fan of ancient and biblical history, I thoroughly enjoyed this book. The author includes an Afterword and a bibliography, both of which I found enlightening and useful. History has not been kind to the historic figure of Lucius Pontius Pilate, the man who washed his hands, symbolically, after condemning Jesus of Nazareth to death. History and Christians blame this man for the crucifixion, but he was under pressure from Rome to keep the peace, at whatever cost. When hearing his name, people instantly associate him with this single deed, the one that, in the end, cost him his own life as well, because any good Roman soldier who errs must take his own life as an everlasting symbol of his compliance to Rome. Little is recorded about the man himself, nor about his wife, Claudia Procula. Lin Wilder’s historical fiction novel, I, Claudia: A Novel of the Ancient World, provides readers with further insight into the man, Lucius Pontius Pilate, and his wife, Claudia Procula. Written in first person narrative, from the point of view of both Lucius and Claudia, the novel reads like a journal, or, to be more precise, two journals (Lucius’s and Claudia’s). The memoir-style presentation opens the doors to a world far different from the one we live in today. The author presents the characters realistically and describes the setting, costume, customs and history with clarity and a great deal of attention to detail and accuracy. The reader gets a true sensation of the times from the two different perspectives of the two narrators. The plot leads up to the trial and crucifixion of Jesus, tracing events clearly outlined in the Bible as well as what few historical documents remain from the time. The story is riveting and pushes forward effectively to its climax, allowing the reader to challenge the accepted perspective of this very controversial figure in history. Very well told. I, Claudia: A Novel of the Ancient World is a work of historical fiction set in ancient Roman society, penned by author Lin Wilder. Written as a retrospective life tale, the central character is seventy-nine-year-old Claudia Procula, the unlucky wife of the infamous Pontius Pilate. Intermingling the story of the passion of the Christ with an intriguing biography of life as a high profile, married Roman woman, the story is told with all the wit and ingenuity that Claudia herself has to hide from those around her. Viewed through her husband’s eyes as a simple, brainless wife, Claudia uses the low expectations put upon her to her advantage, and in her old age she is ready to tell the truth about the life she’s lived, and the secrets she has kept. I found this to be a really fascinating read from an accomplished writer who knows how to move a character right into your heart. Some of the treatment of Claudia is really quite appalling, even for its time, and it’s this combined with her superb wit and inner strength that makes her a hero of the ancient world and for the modern woman to enjoy reading about. The events of the tale are faithful to the traditional tale of Christ, but they are mixed with well researched details from the real lives of Roman people that bring a new level of credibility to the story. Lin Wilder brings history and biblical tales alive in a fresh way, presenting I, Claudia as a superb dramatic work that’s sure to please all its readers.